I enjoy looking back at what posts were popular with readers. This year, it seems readers enjoyed me toying with the idea of minimalism, pretty pictures of vintage things, frugal ideas, and challenges. Here's the top posts (according to page views) for each month of 2011. Click on the image to be taken through to the original post. I like that the two challenges (no spend month and Six Items or Less) were popular. I love a good challenge. I love that they push me beyond my comfort zone and that afterwards I settle into somewhere better than before. So far I have two challenges happening in 2012. The first challenge starts from tomorrow. The whole Little Eco Footprints household will be skipping supermarkets, shopping malls, and super chains for the whole of 2012. I'm really excited about this challenge. Perhaps you'll join me for a week or a month sometime during the year? I'll be back in the next few days to introduce the challenge properly. The second challenge happens in May, when a few friends and I will be participating in Wildendurance, walking 100km in under 36 hours to raise funds for the Wilderness Society. Once I have our registration sorted, i'll be back with a plea for sponsorship. Are you excited about 2012 as well? Will you be facing any challenges (intentional or otherwise) during the New Year? Are you travelling with kids over the holidays? 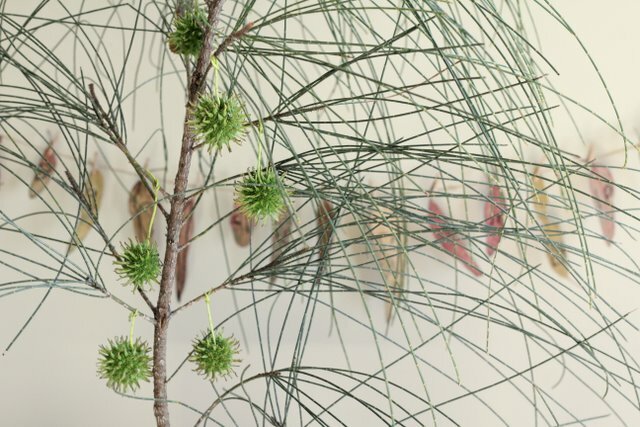 Before you jump in the car grab an egg carton, as it is all you'll need for this simple nature play activity. 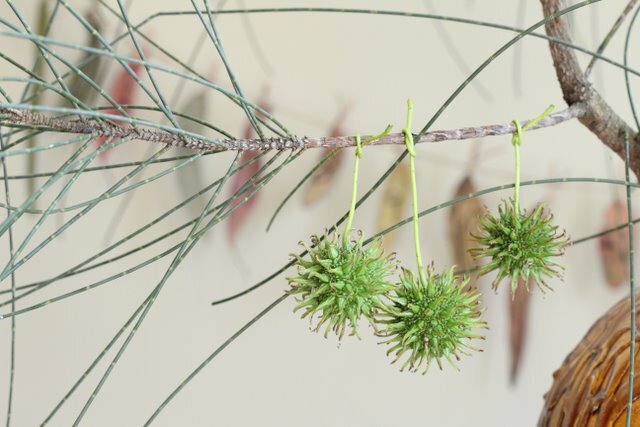 Collect small natural objects like rocks, flowers, leaves, sticks, seeds, or fruits. When I'm travelling I collect the objects during a toilet or meal stop. 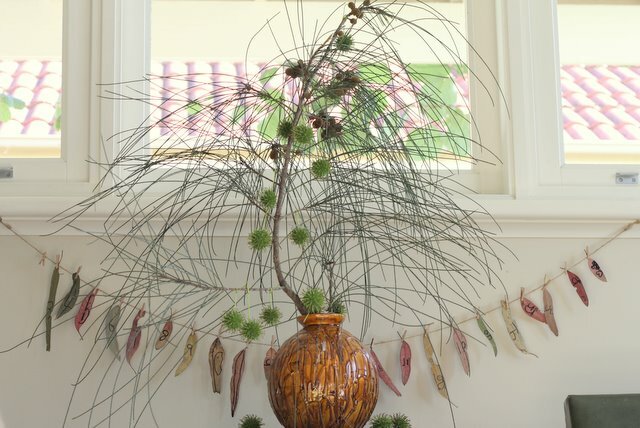 Place your collection in an egg carton and ask your child to sort the objects into different colours, shapes, textures or any characteristic you can think of. ..or dead things, living things, hairy things, smelly things, the list is endless. 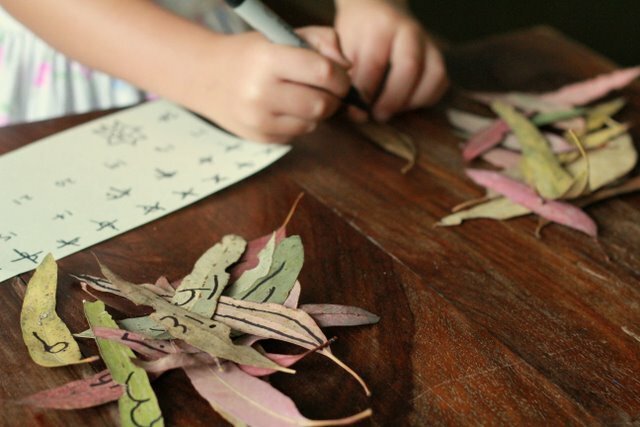 For older children you could try leaf shape or inflorescence type. Little eco loves this game and i'm always amazed at where our conversation goes when discussing the various natural objects. A while back I even managed to trick her into sniffing a Kangaroo poo. ....collecting Kangaroo scats so that we could identify which species of Kangaroo browsed near our tent at night. (In case you're interested it was an Eastern Grey Kangaroo). We're enjoying a staycation this Christmas. My family start arriving tonight so I'll be trying to avoid the computer till after Christmas. I’m a huge fan of ugly fruit. I far prefer blemished, knobbly, and odd shaped fruit over the uniform, hard and travel-wise fruit found in supermarkets. I’m certain that sign would have caused me to pull off the road even if I hadn’t already been stopping. I naively visioned seriously bent bananas and had this overwhelming urge to rescue the deformed, yet perfectly edible, fruit. Of course, the bananas were perfectly normal and the sign was, presumably, merely a tongue-in-cheek poke at the absurdity of our preference for beautiful fruit. The rows and rows of perfectly uniform blemish-free fruit seen in Supermarkets come at a cost. Produce that doesn’t pass the supermarkets ruthless shape, size, and appearance tests often go to waste. In Australia, an estimated 20 to 40% of fruit and vegetables are rejected even before they reach the shops – mostly because they do not match the supermarket's excessively strict cosmetic standards. For example, according to a recent video by the ABC's Hungry Beast, which summarised food waste in Australia, 100,000 tonnes of bananas are thrown out each year because they aren't pretty enough or had fallen and touched the ground. Similarly, 54% of Australian mangoes get thrown away. Tristram Stuart's book 'Waste: uncovering the global food scandal', devotes a whole chapter to “Squandered Harvests”. Tristram discusses the situation in Britain, where the statistics on waste due to Supermarket standards are similar. "Forests have been burnt, hedges flattened, wetlands drained and ponds filled in – sometimes only to produce crops that end up being ploughed back into the earth.” What a waste! This is just one of the reasons I dislike supermarkets (or stupid markets as Kate appropriately calls them). Daddy Eco and I dislike supermarkets enough to challenge ourselves to skip supermarkets entirely for all of 2012. I'll introduce our challenge shortly, but in summary we're challenging ourselves to skip supermarkets, shopping malls (I hate them even more than supermarkets), and super chains for a whole year. But back to those bent bananas.... Bananas are in season at the moment and are super cheap, so I've been topping up our freezer stash. Bananas are easy to freeze. I peel them and place them in an air-tight container. I use them in baking, smoothies, and Little Eco loves frozen sliced bananas. I also make a super easy healthy chocolate and bannana ice cream that can be made in minutes. Into a blender or food processor throw in 4 frozen bananas, 2 heaped tablespoons of natural yoghurt, 2 teaspoons of cocoa, and 2 teaspoons of honey. 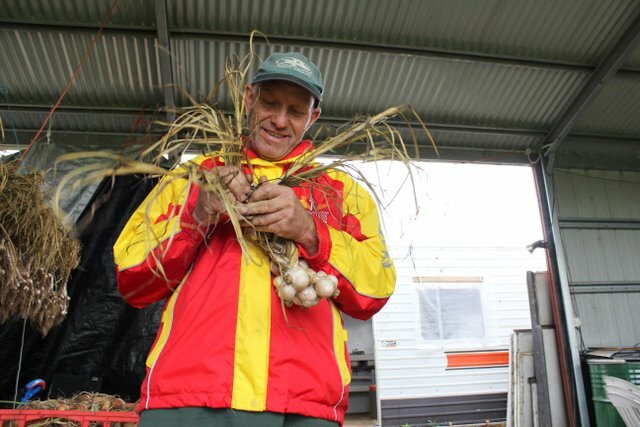 Have you noticed Australian garlic is back on the shelves at your greengrocers? Had you even noticed it had been missing? Garlic is back in season and I was thrilled to receive a bulb of garlic in our recent CSA box from Purple Pear Organic Farm. I'd never imagined I could be so excited about a single bulb of garlic. We've been doing without garlic for the past few months rather than buy the super white stuff imported from China. Food miles aside, apparently imported garlic is gamma irradiated to prevent sprouting; sprayed with Maleic Hydrazide to extend shelf life; and fumigated with the highly toxic chemical Methyl Bromide on arrival in Australia. I’d rather do without that thanks. 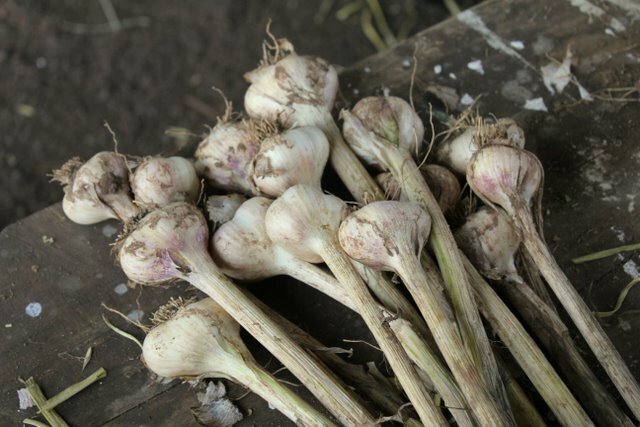 I treasure foods even more when I only eat them in season, though I would prefer not to go so long without eating garlic, so this year I am preserving more. Last season I froze garlic. I separated the cloves and placed them in a container in the freezer. I didn't bother peeling the cloves. It worked perfectly. I would grab a clove when I needed and grate or chop it without even thawing. I'm planning on freezing a huge container of cloves this year so that I don't run out again. I'm also going to trial a few other ways of preserving garlic. Veg Kitchen provides a great overview of the various ways of preserving garlic. I'm going to try both the garlic vinegar and garlic salt. Aren't these garlic braids simply stunning? Little Eco and I popped into Purple Pear this week to chat to Kate about a project I'm helping her with (we'll reveal more soon). We were lucky enough to catch Mark cleaning and braiding the garlic. Little Eco snapped the above picture of Mark braiding. She's captured a moment that makes me smile. I truly treasure that our family's food is grown by someone so passionate about growing local healthy organic food. Wouldn't it be magical if we all knew the person that grew our food? 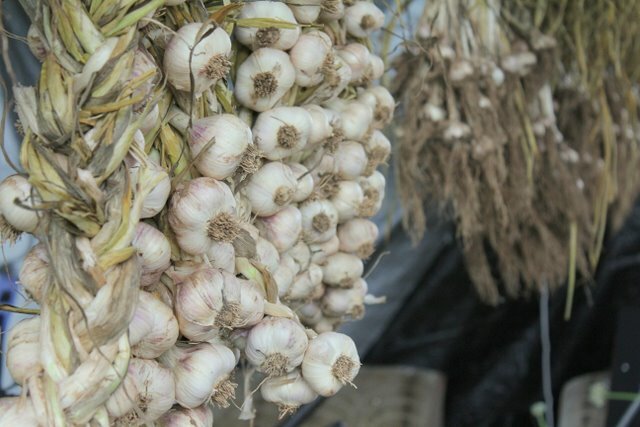 Do you have any good tips for storing or preserving garlic? 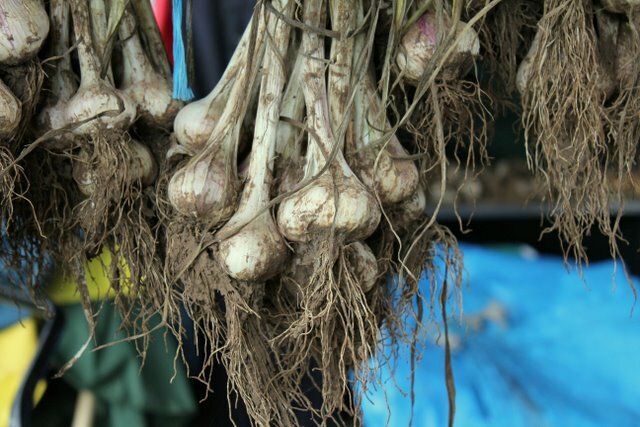 Are you lucky enough to be harvesting your own home grown garlic? Edited to add: Kate and Mark recently shared a garlic braiding tutorial. We're giving charity gifts this Christmas. I love that by giving charity Christmas gifts we're distancing ourselves from the commercialisation of Christmas. I also love that charity giving is super green, because the resources involved include little more than some paper, printing and postage. And let's not forget that charity Christmas gifts are tax deductible. I hope that giving charity gifts becomes a new Christmas tradition for our family. It's not like anyone in our family truly needs anything. I finished our Christmas shopping only moments ago and have a lovely warm and fuzzy feel-good feeling. I don't recall shopping ever making me feel this good. I didn't have to fight the Christmas crowds. Instead I sat at my computer and a few hours later had bought 15 Christmas presents. Each recipient will receive a card that reveals the charity gift we purchased on their behalf. We're having the cards sent here so that we can write in the cards ourselves and wrap them in some of Little Eco's artwork. There are literally hundreds of different charity gifts available, making it easy to individualise gifts. We had fun choosing gifts based on the recipients interests, personality, or sense of humour. We tried to spread our love around as much as possible by purchasing from a range of charities. I was having trouble deciding between all the great charity gifts available so I also bought gifts for Daddy Eco, Little Eco and myself, despite not intending to. After all that shopping I felt like we still had a little more love to share, so supported World Vision by gifting Little Eco's childcare centre and pre-school a duck for a poor family and support for early learning for indigenous children. Saves me baking the biscuits I'd initially planned as teacher gifts. Have you given or received charity Christmas gifts? Would receiving a charity gift make you feel robbed of a gift? 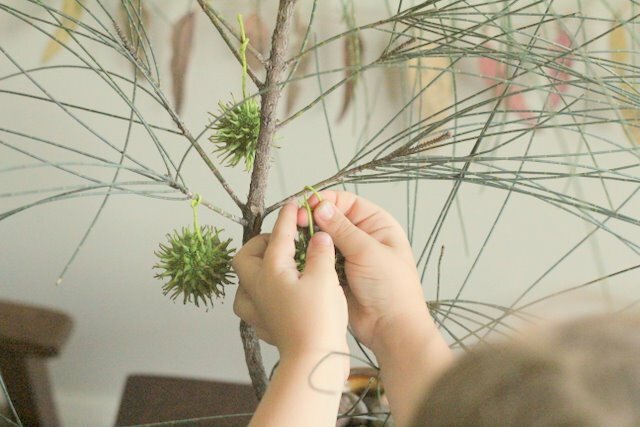 The pictures accompanying this post are of Little Eco creating our leaf advent calendar and decorating our free foraged natural Christmas tree.